Getting fired in fundraising: What’s behind it? Fundraising professional, have you ever been fired from a fundraising job? If you’re a nonprofit leader, have you had some turnover in your fundraising staff lately? Are you trying to hire a new fundraising person now? What if… the real common denominator in fundraising staff turnover was not bad hiring practices, but conditions beyond the fundraiser’s control? We know there’s a revolving door. Development directors are bouncing around and getting fired all the time. We know organizations say that they aren’t finding enough qualified candidates for the jobs. Perhaps because they are looking for three people wrapped into one person, for the salary of a half-time person? If nonprofits are complaining that they can’t find anyone qualified, I would say, what are your criteria? Are they completely unrealistic or simply untenable for someone who actually knows what they are doing? So the experienced people don’t bother, because the salary’s insulting for the amount of work that it will be, and the inexperienced people, who don’t know any better, apply. And fail. And blame themselves, when they really shouldn’t. And they think, “I’m just not good at fundraising” and leave the nonprofit world, when they should be celebrating their failures and being encouraged to learn from them. Instead they get the boot and the revolving door starts again. Development Directors are most often fired for conditions they cannot control. They are fired because they cannot overcome organizational inadequacy, not because they don’t know how to fundraise. So you keep having fundraiser turnover. This week I’m going to reveal the causes of this mess, in a research report called Shafted. 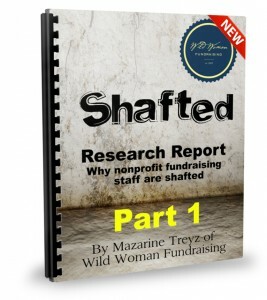 I based this report on journal research, studies of fundraising turnover, and interviews with different fundraising professionals in Canada and the US. If you click here, you’ll be taken to a place to download the research report. In my interviewing I have been humbled by the stories I’ve heard. How many people have gotten shafted in their fundraising jobs, and what they think the solutions should be. I would love to work together with you to learn what the solutions should be. Robert, I would love to chat with you. I’ll reach out via the email you left. UK based development director (head of fundraisng and income generation/supporter development)hugely experienced (27 years) and have six personal career examples of ‘being shafted’. Maybe I will never learn – but the charity development sector is perhaps the bloodiest and least stable sector in the world to work in or so it would appear.